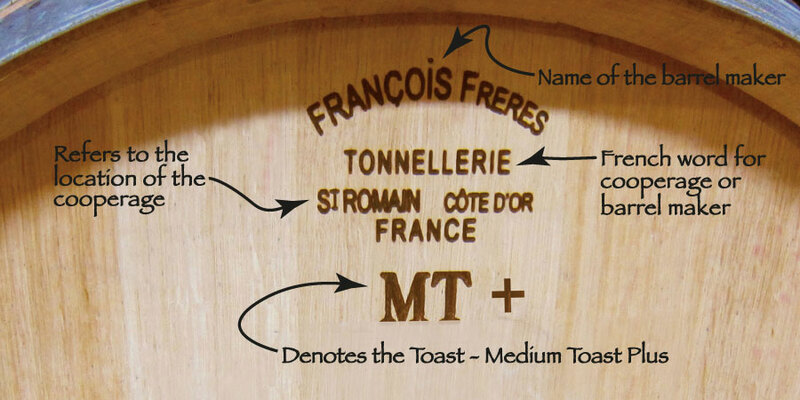 Why has Alberti chosen François Frères Tonnellerie as the barrel maker for Alberti Vineyard Pinot Noir? Mankind is the one species that can be greatly affected by the complex stimuli. This could include sound, like the overtones of a violin playing in a concert, or the aromas of a fine cigar that has been aged in a humidfier, the complex flavors of fine aged cheese, the complexities of the written word in a poem or the visual trappings of a work of art whereby the artist is explaining direction to visual truth. For centuries, wine has provided humans with some of those complexities that excite many of our senses. Site, aroma and mouth "feel" (taste) are expressions of the complex flavor overtones or polymers that are directed by nature and guided by the winemaker. Consider it an expression of the winemaker's style. Combining grapes such as Pinot Noir, which provide the delicate building blocks for all that comes later, many of these building blocks come from the care, management and harvesting of the fruit. The fruit is a manifestation expressing the terroir (the soil, topography, climate and all the bacteria and yeasts that inhabit the vineyard and fruit and contribute to the wine's overall complexity). What the winemaker does from fruit harvest to the final bottled wine is a clear expression of his creative skills and knowledge. Élevage or aging refers to the time wine ages in the barrel from the end of the ML (Malo-Lactate) fermentation through to bottling. Élevage can be compared to the time spent in the raising of a child. It's as accurate as it is telling: Barrels shape a wine's character the way parents shape a child's personality, for better or worse. Like a bad upbringing, the wrong barrel regime can be detrimental to the final personality of the wine. Quercus sessilis is generally regarded as the finest oak, as it has a tight grain and is rich in aromatic compounds. This is the species found in the Forest of Tronçais Tronçais (tron-say), a famous subsection of the Allier forest of France. With deep, fertile soils producing trees of great size with often the tightest grain, it's a favorite of winemakers looking for slower extraction and more finesse on the palate. Only the best logs can produce proper barrel staves (the wood that comprises a barrel). The grain must be straight and tight, without knots or imperfections, either of which could cause the barrel to leak. This wood contains aromatic compounds such as lactones, eugenol and vanillin which will contribute to the flavor of the wine. Wood polyphenols and ellagitannins will contribute to the structure and taste of the wine. Tannins from wine grapes represent between 2 and 4 g/L. But oak tannins extracted by ageing in a barrel can be up to 0.2 g/L. These oak tannins have strong antioxidant properties. They make the wine more tannic (enriching its structure) and they also make it tastier. At the same time, other components add some sweetness to the wine. The cooperage processes, such as the seasoning of staves and the different barrel-making steps including toasting, will change the oak composition and, in particular, the nature and concentrations of the above-mentioned compounds. Alberti Vineyards uses barrels which are Medium+ Toasted with Toasted Heads. The combination of the oak from the Forest of Tronçais, the aging of wood for a minumum of two years, and the toasting provides Alberti with those variables of flavor and aromas which allow the complex polymers in the wine to form. Barrels in the cellar are also interacting with the environment. Oxygen crosses the limits of the barrel through different pathways, and is diluted into the wine. Oxygen allows ethanal to be produced in the wine. Both oak and wine polyphenols can interact with ethanal and generate different combinations: between tannins, between anthocyanins, and between tannins and anthocyanins together. The consequences of these chemical reactions are the following: The color of the wine is stabilized and its intensity increases, there is a decrease in the bitterness and astringency of the wine, and* Tannins are transformed to give the wine its softness. Click the image below to see a short video about François Frères Tonnellerie.